I previously reviewed the ‘Craic‘ beard balm from Belfast Beard Co but since then, they have changed supplier for their Beeswax. I think that this might be one of the creamiest and smoothest balms that I have tried, it is ridiculously creamy! It is a blend of Coconut oil, Shea butter, Beeswax & Hemp oil and has a medium consistency. The result? Well if I was looking to find any faults in this product, I would say it would be impossible to find one! It has left my beard feeling really good, softer and with a light hold and it is so very easy to work through the beard as it is so so smooth. I have a confession, I have been an Eejit! The review was almost postponed due to further injury to my knee and I almost postponed. I took what I saw on the website and failed to check the tin, which I always normally do! But anyway, I did say the scent had notes of Lavender and I was right, because it has………drum roll please……… lavender in the blend! It is fresh, it has ‘lavender notes’ and is just slightly pungent and aromatic with a herbal like quality. For me the whole product is a triumph, from the creamy consistency to the beautiful scent. 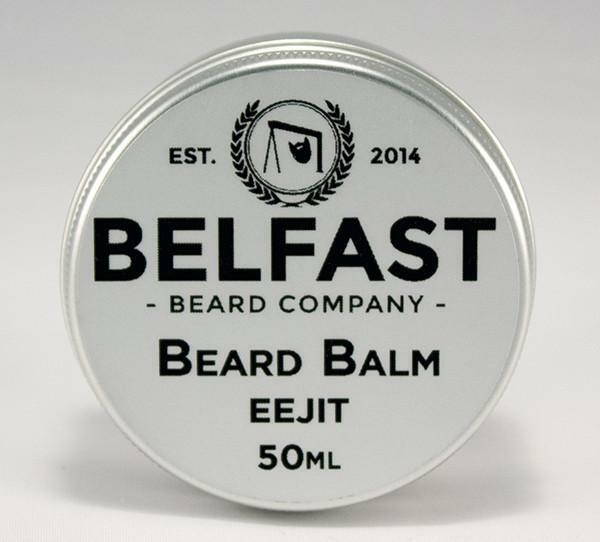 The Belfast Beard Company Eejit beard balm is available in 50ml costing £14.50 and 100ml costing £24.95 from the website.